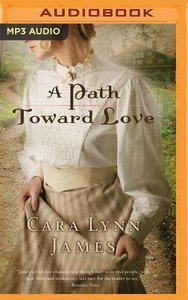 Customer Reviews For "A Path Toward Love (Unabridged, Mp3)"
I always enjoy a book that can both keep me entertained, yet also make me think, so well done to A Path Towards Love. It reminds me of novels like Making Waves and She Walks In Beauty, but I think it's better than both of them. A historical romance that is well worth reading. Thanks to Thomas Nelson and Booksneeze for providing a free book for review.